How Brexit is our new PM, Theresa May? Discussion in 'Western Europe' started by James7, Jul 13, 2016. The previous PM, David Cameron resigned in direct response to the No vote in the EU Referendum. He had consistently campaigned to stay in the EU. On his resignation David Cameron stated that it would be wrong for him to be the captain that steers our country to its next destination". But how Brexit exactly is the new PM, Theresa May? She campaigned alongside David Cameron in favour of staying in the EU. So why bother changing PM's since they both campaigned to stay in Europe. Theresa May is the former Home Secretary who was known for her tough stance on immigration. Some of her statements on immigration were borderline racist and the Tories may like her character. She has also made Boris Johnson, the former London mayor who led the Brexit campaign, foreign secretary in her new government. I think it shows the overall confusion of the political establishment. It seems nobody truly thought that the Brexit camp would win the referendum and they are now flustered in trying to figure out a solution of some sort. To me this was apparent because the two noisy leaders of the leave campaign Boris Johnson and Nigel Farage stepped down from their positions as well. The politicians seemingly changed their attitude and refuse to move forward with the Article 50 process, seemingly as they realized what consequences this may have. But I don't think that David Cameron's decision is that surprising at all. He got elected and promised the referendum he lost. Naturally he wants to jump of the ship as soon as possible like elitist he is, without caring for the overall consequences of the people he's supposed to represent. Well... Given that Boris has been made Foreign Secretary that is no longer the case. It seems he will have some say in the Brexit. It will be interesting to see how this goes. A bit of info on the new Secretary of Exiting the European Union. He seems like the typical ignorant Brexiter. His "plan" is pretty much fantasy. I thought it was suppose to be Boris and Natasha not, Theresa. The previous PM, David Cameron resigned in direct response to the No vote in the EU Referendum. He had consistently campaigned to stay in the EU. On his resignation David Cameron stated that it would be wrong for him &#8220;to be the captain that steers our country to its next destination". Don'tchya just hate labels? I do. So I will go with Social Conservative. by working people losing economic ground to the richie rich and underselling EU labor foreign and domestic. A different kind of Conservative. Add to that "border control" well, they got a channel. With David Davis' appointment as minister for leaving the EU, my fears that it would be watered down are totally removed - especially with Nigel and Paul Nuttall watching proceedings like hawks as well. The charlatans are about to find out that the Brits are not quite as stupid and malleable as they think. Much to my surprise May has hit the ground running, and in a good way. I hope today's appointments will include Michael Gove, a much underestimated politician. If Corbyn had had any influence it would be well under way already. I agree, but you don't sign up to conditions which haven't been agreed upon first? It's very important to get it right, also to make sure that we're not being given the run-around with ambiguous weasel words. Boris Johnson is a joke around the world. The Secretary for Exiting the EU does not seem much better. If you wanted to (*)(*)(*)(*) of the EU you have started down the right path. I doubt there will be agreement on anything before Article 50 is invoked. Your new secretary seems to think he can wait a couple of years while you negotiate trade deals. Good luck with that. You're about to discover that you need us much more than we need you. Cerb... That's exactly what you thought before joining. You should be old enough to remember when the UK was the sick man of Europe. You know... BEFORE joining. I remember it well but it was The Blessed Margaret who restored our global reputation to the status quo ante, not the (note this) not the EEC. The EU came much later. I don't think, I'm certain of it! I have this gut feeling, doncha know? Its politics so no, it doesnt make a lot of sense. Cameron did put his name to holding the referendum in the first place (which was about seeing off the challenge from UKIP) but being able to negotiate sufficient compromise with the EU to support a remain vote from the country. On that hes generally seen as having failed (though some would say destined to fail on the negotiations). He would have personally had political difficulties negotiating Brexit following that and thats why he stood down on the basis of the Leave vote. 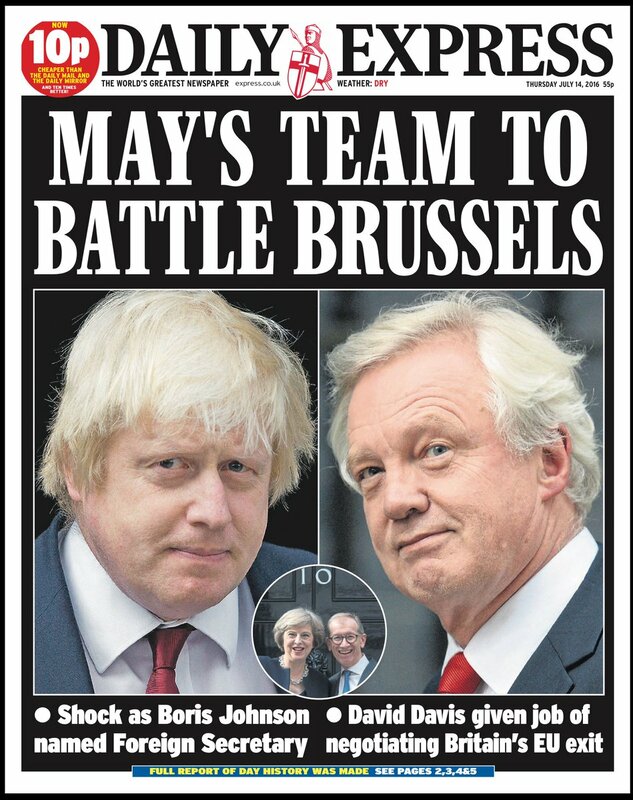 The early expectation was that a Brexit supporting leader would replace him but Gove stabbing Johnson in the back scuppered both of their chances, leaving May as the only viable candidate. She supported remain but she wont have anything like the Brexit baggage Cameron would have if hed stayed on and she can (and has) approach the situation afresh, acknowledging the will of the country and moving forward form that point. It could be argued that were in a better position in negotiations without a rabidly anti-EU Prime Minister, though how Johnson approaches his role will obviously be significant too. Divorces generally run more smoothly if the partners are still able to communicate cordially with each other. But I think there is no reason to further debate this issue with people who were supporting the Brexit prior to the referendum. I think, that just like children growing up, they have to make their own decisions and live with the consequences... Personally I hope for a quick exit. I'd like to see Article 50 signed this year and as a reaction to it, a second Scottish referendum as well. that create an illusion that our land, our time, our talents... .have very little real value? I agree. I hope it is done as quickly as possible. While I do not want to punish the UK it really depends on how they approach the exit. If the people negotiating on their behalf are half as obnoxious as their campaigners I will start changing my mind. Anyone who knows the UK's history with the EU already has a negative view of them. They have always been a reluctant and unproductive member who wanted to have the market and nothing else. I can recommend Thunderf00t's channel on YouTube. He has done some excellent videos on Brexit. Dave Davis is the new Brexit Minister and he has already stated that the formal process of actually leaving the EU (i.e. triggering Article 50) will not begin until the end of this year or maybe the beginning of next year. This follows what Theresa May herself has said that she, "would not trigger Article 50 before the end of this year" or "until the UK had secured better deals". This doesn't sound fully committal to me. Surely Article 50 should have been triggered immediately after the Referedum results were known. That would have required politicians with a plan. I mean... Not even Farage looked happy after having won which should tell you everything. What worries me is that some in the UK think you can negotiate a deal and then hold another referendum. That is not going to happen. Ronald Reagan convinced me creating an illusion is great for the economy. The bits and clips I am catching on the News, mostly RT, seems to indicate some great happenings in Britain. May indicating the Brexit vote was working peoples' dissatisfaction and Boris Johnson with views that will break the sanctions hold on the world. I like the policies I am hearing. What should I be concerned about, if I were a Brit?